Technically efficient and freeware greeting card maker utility provides you the complete solution to generate best quality and wonderful looking greeting cards as per user?s choice in easiest way. Flexible card maker software facilitates user to design colorful beautiful greeting cards using various designing objects including Ellipse, Circle Pencil, rounded rectangle and other objects in convenient and cost effective manner without having any expert guidance. 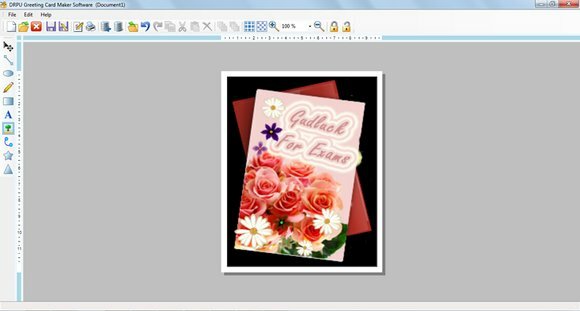 Easy to use greeting card maker tool helps you to create attractive, lovely and eye-catching greeting cards for various occasions in most affordable and convenient manner only in fewer clicks of mouse. Company introduces advanced card maker program with full functionality and flexibility to save designed greeting cards in computer memory for further editing or modification without taking any extra charge. With the help of greeting card maker software user can create varieties of greeting cards for some special occasions including holiday cards, thanksgiving, Christmas, New Year, Valentine?s day, Mother?s day and Father?s day. Professionally developed card maker utility is user friendly and has interactive graphical user interface to design and print greeting cards of any type. Technically sound card maker software allows you to make changes in designed cards as per your choice and requirement. Proficient and compatible card maker program doesn?t require any expertise or technical skill to design attractive and amazing greeting cards with option to specify the color and background settings. Best card maker utility contains data set series features that help you to generate multiple copies of greeting cards. * Facilitate you to design greeting cards in varieties of shapes. * Assist you to generate attractive and amazing cards. * Provides you highly interactive graphical user interface.